Telenor has leveraged its success as a telecommunications company to build the first fully online and mobile-direct bank in Serbia, Telenor Banka. For its Finovate debut, the company teamed up with Asseco SEE to demonstrate its Automated Online Handset Loan powered by ASEB Multichannel Solution. The solution enables customers to easily apply for a loan to purchase a new mobile device. Using a combination of banking and telecommunications transaction data, offers are customized, relevant, and likelier to be used. The “Tele” in Telenor stands for Telco, which is a large part of what Telenor Banka brings to the table. The bank was founded in 1996 as ALCO bank, but changed its name and ownership to Telenor Banka in 2014, when it became a member of Telenor Group. The goal was to provide the citizens of Serbia with modern and innovative mobile and online financial services through Telenor Banka. 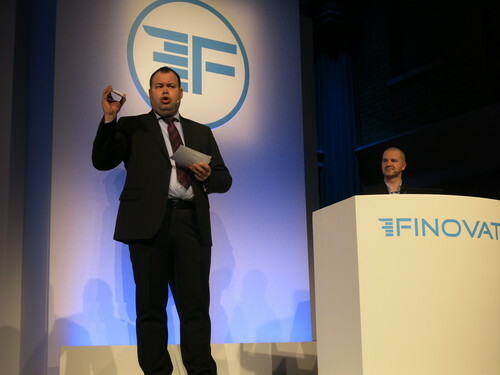 At left: Martin Navratil, chairman of the executive committee for Telenor banka, presented at FinovateEurope 2015. The presented innovation platform enables Telenor Banka’s customers in Serbia to get customized offers by two industries in one place— telecommunications and banking. The demo version of the solution is an example of a fully automated and personalized online offer of purchase loans for smart devices, personalized to the customers’ needs in real time. While the company anticipates adding other service providers to this centralized dashboard, the current technology already offers customers conveniences such as a bill pay solution called “Bills on Click”; P2P payments to a phone number or email; and, launched in Dec 2014, the interest-free loans for purchasing smart devices from Telenor. And in partnering with Asseco SEE, Telenor Banka has extended this service a step further with its Automated Handset Online Loan. The access to banking and telecommunications data alerts the platform that a bank customer may be in the market for a new smartphone. Moreover, the platform can extend a loan to the bank customer that not only offers rates and terms that are compatible with the customer’s financial situation, but also personalized telecommunications services and products that would make the most sense given the customer’s history. Moving back and forth between the Telco and the banking functions of the platform is seamless for both the customer on the front end and the bank on the back end. Credit scoring, AML and KYC all take place on the platform, and relevant agreements and contracts from both the telecom and the bank are generated immediately for the consumer. Telenor Banka followed up its Finovate debut with a major milestone: the company celebrated its 50,000th account opened, making Telenor Banka one of the fastest-growing banks in the CEE region. According to Martin Navratil, chairman of the executive board and managing director, Telenor Banka is “focused on providing easy-to-use financial services and shifting from traditional banking to innovative, customer-oriented mobile solutions.” The technology demonstrated in February is scheduled to be available in the second half of 2015. Read our Finovate Debut feature of Telenor Banka’s FinovateEurope 2015 partner, Asseco SEE. See Telenor banka’s live demonstration from FinovateEurope 2015. Moven updates iOS and Android apps for easier views of balance and spending. Multi-factor authentication now available for Venmo users on both iOS and Android. Mobile World Live interviews VP of Telenor Financial Services and CEO of Valyou, Viktoria Erngard. FT.com Business & Economy feature on P2P foreign exchange highlights TransferWise, CurrencyFair, Currency Cloud, and Kantox. Misys wins honors in three categories at FStech Awards 2015. HedgeCoVest adds 14 new models to its platform. Business Insider Australia features Xero. Yodlee announces 100% revenue growth in Australia and New Zealand. Check Point to acquire Lacoon Mobile Security for a reported $100 million. Finishing up the first session of the day is Telenor banka, which has teamed up with Asseco South Eastern Europe (SEE) to offer their Automated Online Handset Loan. Telenor banka is the first fully mobile online bank in the SEE region, showcasing a mobile-device loan-offering based on Telco and banking’s big-data analytics. The right offer, at the right time, at the right place: for each customer, it is hassle-free and only a couple of clicks away. The automated process is achieved with the help of Asseco SEE’s ASEBA Multi-channel Hub. Metrics: Telenor banka has 130 employees, is part of Telenor Group with 179 million users, is present in 13 markets. Asseco SEE has 1,400 employees, is present in 13 countries and is listed on WSE. The 70+ presenters that will showcase their new tech on stage at FinovateEurope in two weeks are now unveiled. To take a closer look at the presenting companies, we’re continuing our Sneak Peek series. Today, we’re featuring Financial Media Solutions, Fiserv, Intelligent Environments, mBank & i3D, Pirean, and Telenor banka & Asseco SEE. Financial Media Solutions’ MAPPS simplifies Videographics, making it possible to create financial content in digestible bite size video formats for broadcast to any device, including smartphones. Communicating client content by video is the future. MAPPS resolves the challenge of how institutions better engage clients in financial concepts, even via their smartphone. Fiserv is one of FORTUNE magazine’s World’s Most Admired Companies and will demonstrate next generation digital banking interactions. This innovation is geared towards the consumer and will allow greater control and transparency over their spending and banking habits. Atkinson is a Sales Executive in Digital Channels and Payments team at Fiserv, Inc., focused on new clients across EMEA, with previous experience in core banking and CRM. Abbot has 25 years’ sales, business development experience in payments & eCommerce joined Fiserv’s payments business to support development activities in the EMEA region. Intelligent Environments is an innovative provider of mobile and online solutions for financial service organisations. No firm is an island – we all have a shared interest in responding to the growing threat against cybercrime. Clayton Locke is a keen sailor. He is hoping for calm waters come Finovate! mBank, financial sector innovator & i3D, world-class provider of high-tech virtual reality solutions, developed an ultra-modern interactive digital bank branch. mBank & i3D dare to challenge the traditional notion of physical bank branches with ultra-modern multi-touch screens, motion-sensing and face recognition technologies. Pirean enables organisations to provide secure, people-focused access for employees, customers, and partners across on-premise and cloud-based applications. Pirean’s Access: One is an Identity and Access Management solution designed to provide a first class user experience anytime, anywhere. With Telenor banka & Asseco South Eastern Europe, banking goes mobile – changing customer experience and reshaping banking products & services to fit mobile, brought by Telenor banka in synergy with Telco, powered by Asseco SEE multichannel solutions. IT is a fully automated and personalized online handset loan enabled by Telenor banka and Telenor, powered by Asseco SEE. Managing Director of Telenor banka responsible for the design and implementation of the bank’s strategy, having great experience in Telco and Finance sector. Executive manager with experience in running and establishing new business in Poland, SEE region and Turkey. Managing international structure with over 1,400 people in 12 countries. Started his career in Telenor, initiated Telenor M&A initiative in financial services, currently responsible for entire customer value chain and go-to-market process. We’ll feature six more companies later this week. To see them all demo live, get your ticket to FinovateEurope 2015.